Balkisa Abdikadir is rarely at a loss for words. The 15-year-old sophomore talks at top speed, and often excitedly. But last Wednesday evening at the Young Writers Project office in Burlington, Balkisa simply stared at the poem she had written, titled "Home." "When you crave something, what's another word for it?" she asked. "'Hunger,' 'long,' 'thirst'?" offered Denise Casey, jotting down the synonyms. On the other side of the room, Lena Ginawi belted out the first two verses of "The Star-Spangled Banner." As her voice dropped to a low hum, her fellow poets — Hawa Adam and Kiran Waqar — took over and performed a piece they had composed called "American Dream." All this time, Rajnii Eddins watched his mentees through the digital camera he was holding. In their poem, Hawa and Kiran express gratitude to their parents for "fighting tooth and nail" to help them achieve success. But they also write about their struggle to maintain "two worlds in one body." Balkisa, Lena, Hawa and Kiran, four 15- and 16-year-olds who call themselves Muslim Girls Making Change, will represent Vermont in this summer's annual Brave New Voices International Youth Poetry Slam Festival, a conference and competition for youth. This is the first time since 2003 that the Green Mountain State will send a team to the competition, which takes place July 12 to 16 in Washington, D.C. The YWP is sponsoring the team; Eddins, a veteran slam poet, and Casey, a spoken-word artist, are helping the girls get ready for the event. Youth slam poetry has the power to "unlock kids who have struggles and want to voice their struggles," said Geoffrey Gevalt, founder and executive director of the YWP, a Burlington-based nonprofit that runs an online writing community for youth. Such poems may also make the audience "uncomfortable" and encourage listeners to "think about something in a different way," he added. Gevalt is proud that four first-generation Muslim Americans will represent Vermont, a predominantly white and ethnically homogenous state, at a time when that population has been the subject of contentious national discourse. "We're breaking down stereotypes," he said. Eddins agrees. "The intersection of their identities resonates with today's times," he said. 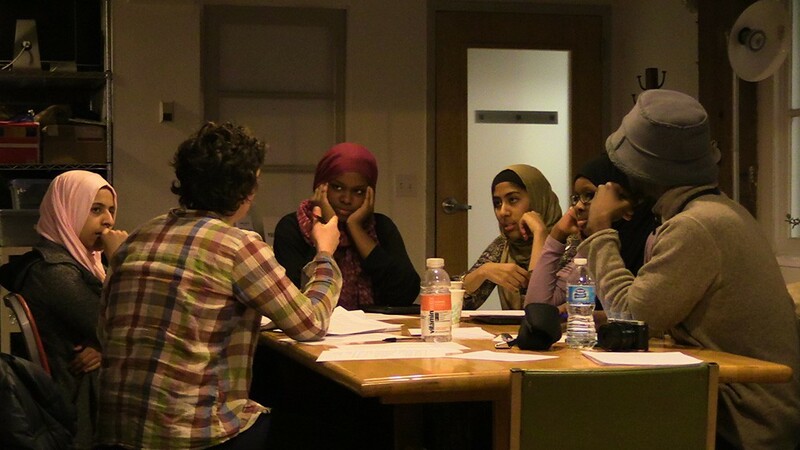 Although the girls formed their slam poetry team a little more than a month ago, they've known one another for years through school and gatherings at the Islamic Society of Vermont. Muslim Girls Making Change, or MGMC, started as the name of an Instagram account they created when they volunteered with the Vermont Refugee Resettlement Program. They kept it when they formed their poetry team, they explained, because both projects have a common mission. The girls want to show that Muslims are just like anyone else, and that they're contributing members of society. "We're just trying to make a change through humanity, so that [people] don't think of us how the media portray us," said Lena, a student at South Burlington High School. Of the four, Hawa and Balkisa have the most experience in writing poetry. In February, the two Burlington High School students performed on the steps of the Vermont Statehouse — their biggest "stage" to date — where they recited a poem that called for a smoking ban at the Queen City's parks and beaches. But Hawa didn't want to just stand stiffly and recite poems, she recalled. When she learned that YWP was hosting an audition for the Brave New Voices Festival, she roped her friends into joining her, and together they created their breakout piece, "Wake Up, America." In the poem, the girls write about their experience with prejudice and decry the public's indifference to acts of aggression committed against American Muslims. Gevalt was initially disappointed when only five teams came to the auditions, he admitted. But MGMC blew him away, he said, and he decided to register them for the Brave New Voices Festival. He proposed sending the girls as a noncompeting team, since they were first-timers, but the teens insisted on going up against other slam poets. Kiran said she finds performing onstage and expressing herself "empowering." It helps that no one can interrupt a performance, the South Burlington student added: "What you're saying, people are actually going to listen to it." Since MGMC made their debut in March, they have revised "Wake Up, America," adding personal anecdotes, and developed more poems, with themes such as multiculturalism and body image. For the festival, the quartet needs 10 pieces in its repertoire, some performed as a group and others in solos. "Most of our poems are about making the world a better place," said Balkisa. For example, in "Home," she writes about her longing to return to a conflict-free Somalia: "I hope we see each other beyond our tribes and realize that 20 years of war was worthless. I hope people will realize their genes contain more than soft wavy hair and that it's filled with the resemblance of those before." Every Wednesday and Sunday, the teens meet with their coaches for two hours. As the competition draws nearer, they will have more formalized sessions and group-writing time. Eddins wants the girls to up their game by incorporating more gestures and movement. "Word becomes living when you act it out," he explained. The interplay of the girls' distinct personalities is part of the group's charm, the coaches said. "Lena's quiet and insightful. And she drops quiet jokes," Casey noted. "Balkisa is very joyful and emotional." Eddins chimed in: "Kiran has a brilliance to her expression. And Hawa is the natural-born leader." Over the next few weeks, MGMC will perform at various locations in Burlington to raise the $4,000 they need to travel to Washington, D.C. The events will be previews of what the public can expect from the group after the tournament, said Gevalt. The YWP director wants to get a slam program going, in collaboration with local schools, and plans to work closely with these girls. "The best of our programs have been led by youths," Gevalt observed. Lena, who considers her co-poets and coaches her "second family," said slam poetry has helped boost her self-confidence and improved her public speaking. "I don't think I'd stop doing this," she said. "If I stop, I won't be as happy as I was when I was doing poetry and slam." "We'll definitely stick around," Hawa said. 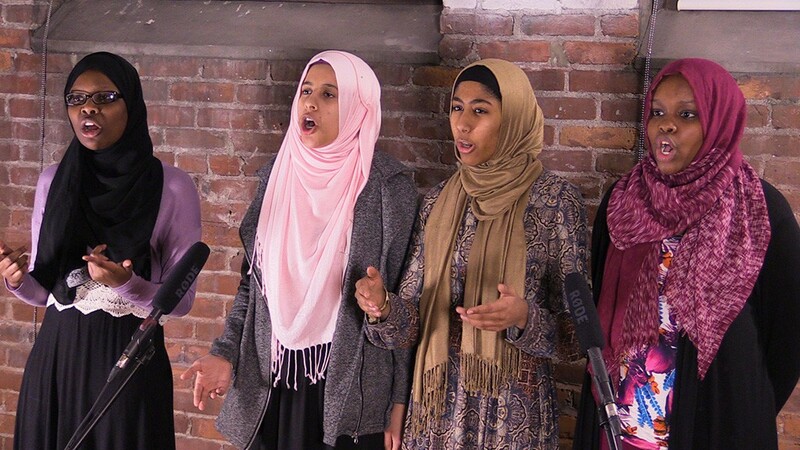 Muslim Girls Making Change perform on April 20, 6:30 p.m., as part of the Young Writers Project's final Teen Open Mic of the season, at Karma Bird House Gallery in Burlington. Free. The original print version of this article was headlined "Team Vermont"